Since 1994 I’ve had the pleasure of contributing to KUOW’s Weekday while on the road via commentaries and interviews. For our latest trip, I sent in 24 sound clips that aired on the shows “sound of the day” segment. 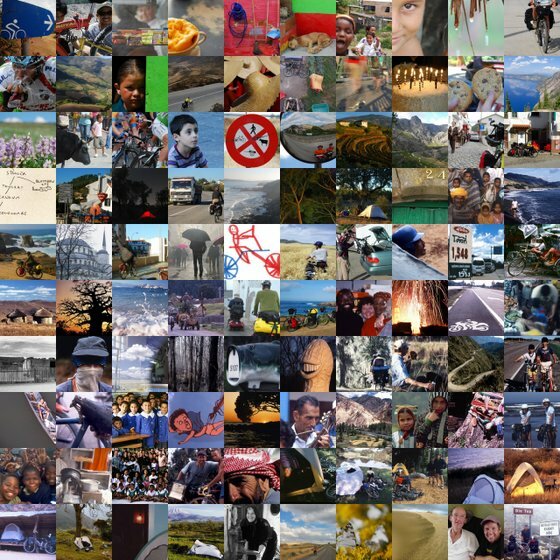 Here are clips 13-16. 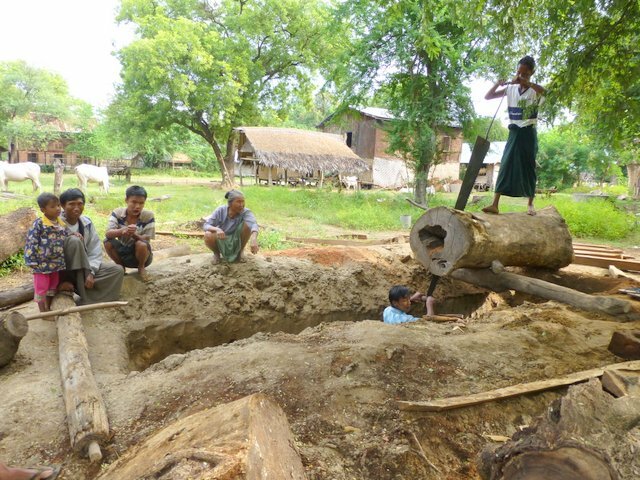 Road work in Burma is done mostly by hand … picks and shovels, even bare hands, in place of machinery. Tar is delivered to the side of the road in metal drums. A pit is dug and a wood fire is built to heat the tar up so it can be spread … bowlful by bowlful. 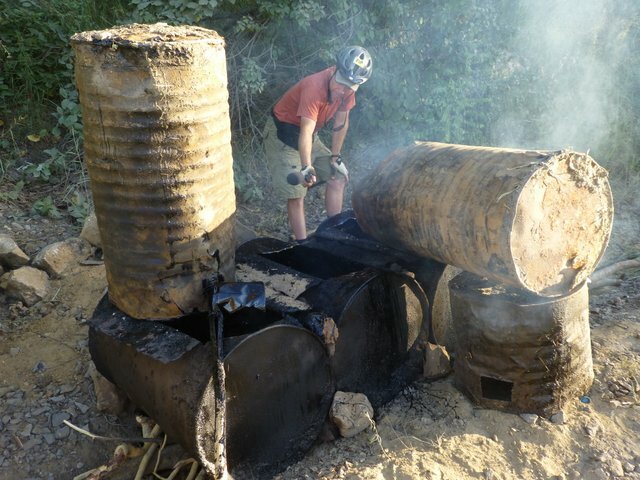 We came upon this smoldering fire beneath several drums. The tar directly over the heat was popping as it approached boiling point, while the barrel above oozed tar, like a giant tube of black toothpaste. We were pedaling a back road outside the city of Miektala (a dirt track really)–bouncing and weaving our way along the rutted route–when we heard the sound of a hand saw. I glanced over through the trees and saw a man standing on top of an enormous log sawing away. The way he handled this huge saw, I thought he must have Herculean strength. A closer look revealed that he had a partner. They had dug a wide four foot deep ditch, which allowed a second person to pull down on the other end of the saw from below. This one cut would take these two men the better part of a day to complete. The family was as entertained by meeting two foreign cyclists, as we were at watching this human saw mill in action. 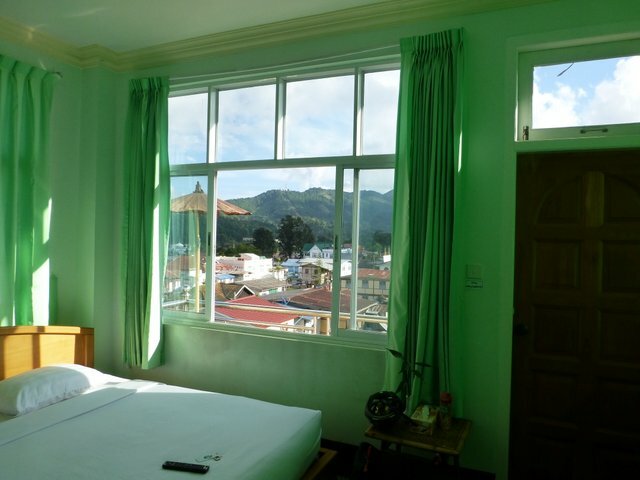 We found a nice hotel room with a balcony in the mountain town of Kalaw. It was across the street from the Buddhist temple. The chanting was being broadcast in hyper-full volume. No worries. It would stop late in the evening. Or so we thought. It continued. Midnight. 2am. 4am. As the sun rose, the chanting still continued. We discovered at breakfast that the chanting wouldn’t stop … for three more days. We opted to pedal down the road. The back roads around Pindaya wound through farmland; a patchwork of yellows, greens, and browns, contrasted with brilliant blue skies. Off the road, we saw a group of men threshing grain. 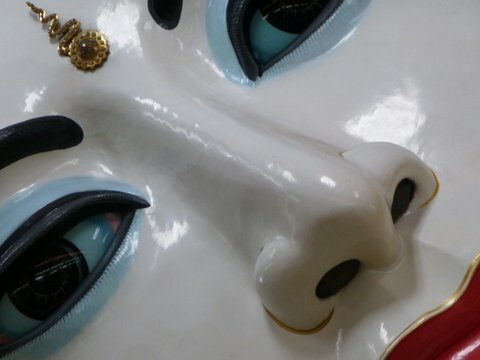 We’d seen it many times (both men and women performing the task), but never up close. Well. No time like the present. We pedaled over and parked our bikes. 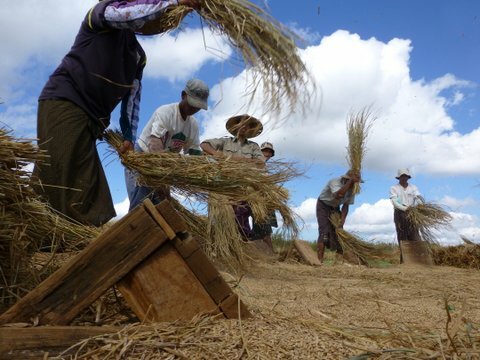 There were large piles of recently hand harvested rice laying about. I grabbed a pile, and just the sight of a westerner trudging across the field, sent the men into waves of laughter. I later got a lesson on how to thresh. I need a lot of work on my technique. Since 1994 I’ve had the pleasure of contributing to KUOW’s Weekday while on the road via commentaries and interviews. For our latest trip, I sent in 24 sound clips that aired on the shows “sound of the day” segment. Here are clips 9-12. 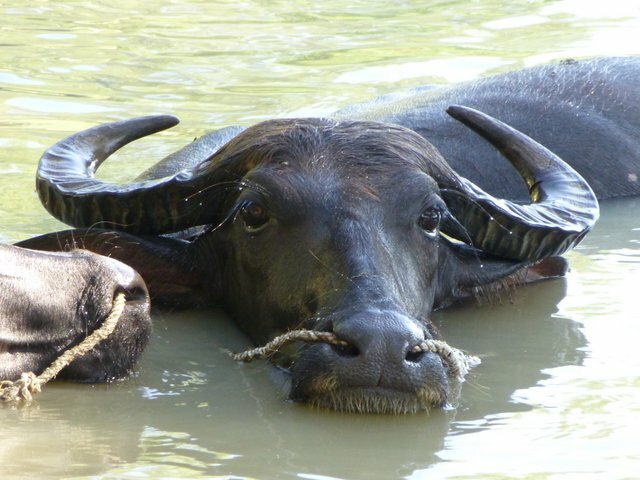 In the heat of the day (about 93 degrees), while pedaling the dusty highway north of Mandalay, we came upon a herd of two dozen water buffalo doing what we should have been doing–bathing in the canal. Water buffalo are heavy breathers. I wouldn’t want to try and take a nap with one. The splish-splashing is the sound of their ears and horns as they shoo away flies. 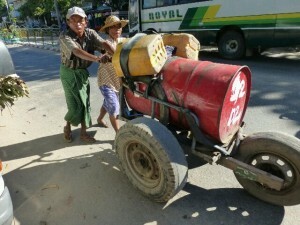 The scooter and bus you hear are on the way to nearby Shwebo. George Orwell was stationed nearby in a small town, which became the location for his novel Burmese Days. What you are hearing is the motor of a large portable cement mixer. You can hear the sound of a shovel digging into wet concrete. Later the sound of metal bowls hitting the street as they are delivered back empty, to be filled again and again. The human part of this operation is drowned out. But it’s there. A crew of six men are mixing and shoveling that concrete. Over 20 women are delivering that concrete from the street level to the second story of the project, one metal pan at a time. Each pan is filled with concrete and then with help is hoisted on top of a woman’s head. A large and wide bamboo ladder has been erected to accommodate at least four women across. They climb this ladder, posture ramrod straight, where the bowl is lifted off their head and poured into it’s desired location. They then back down the ladder to repeat the process. 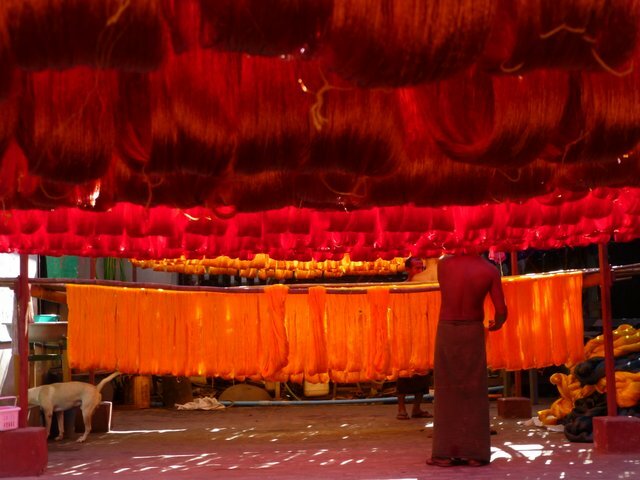 Dressed in plaid shirts and multicolored longyi, the wall of women workers move like an ornate slow motion piston. Beautiful. Shocking. Amazing. Horrible. All of those words flashed through my mind. 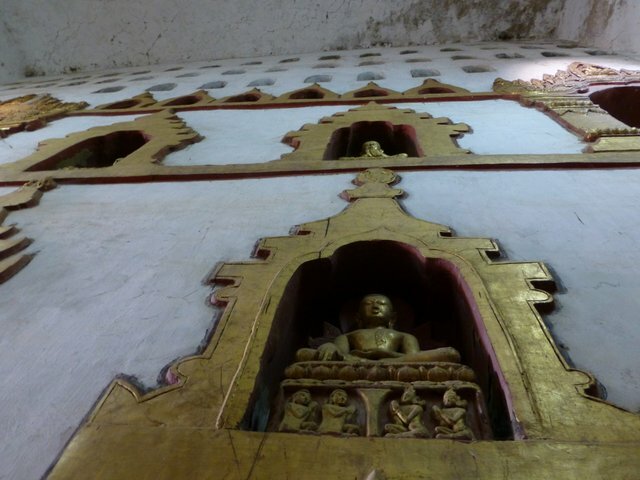 There are hundreds of temples and pagodas in Bagan. Ananda is one of the largest and most visited. 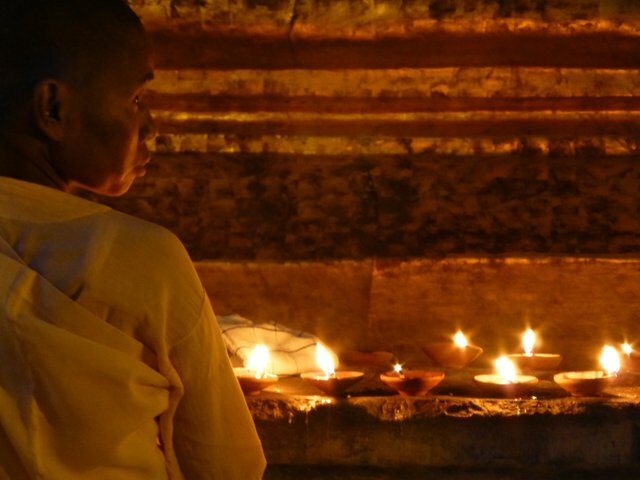 Inside the tile floors are cool, and locals stop to pray and leave offerings or light incense. There is a school here as well. These students and teacher are chanting about how Buddha was a holy man, above all others–or at least that is the rough translation I was able to get from a local. This large pagoda in the town of Nuang U, near Bagan, is one of the centers of activity for the full moon festival. Late afternoon is calm and peaceful, but the setting sun brings the chatter of sparrows and nuns. The sparrows are looking for bits of food offerings, while the nuns are rushing to get all of the candles placed and lit around the enormous base of the pagoda. Myanmar is in the news. It is ranked as one of the top five travel destinations by several major publications. President Obama became the first US president to visit while in office. Makes you want to take a bike trip there, doesn’t it? We did. We toured Myanmar (Burma) from October 21 – November 21. We brought our own bikes … and lots of cash. We enjoyed. A lot. The people of Myanmar are the most genuinely friendly people on the planet. How do we know? We brought our friendly meter, and it maxed out beyond “uber-friendly”. 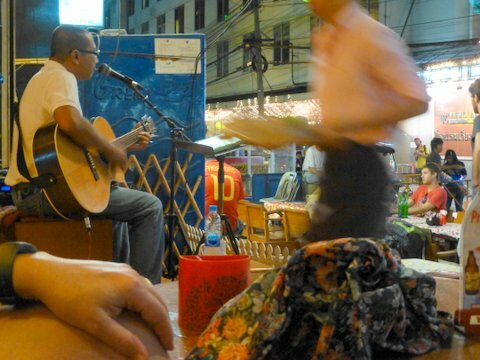 Below are some random tips from our personal experience in Myanmar. WARNING! Things are changing at such a fast pace, this information might already be out of date. If you are planning a trip to Myanmar, look on the Thorn Tree forum for comments from recent visitors. 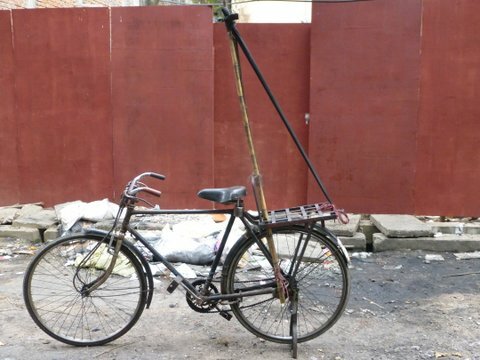 Or go to and read journals from cyclists who have recently pedaled in Burma. Getting You (and your bicycle) there. 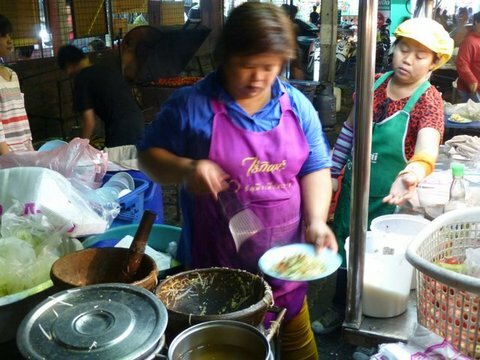 Bangkok is where you find some of the cheapest airfares to Myanmar. Air Asia has daily flights from Bangkok to Yangon, and in October began flights to and from Mandalay. This airport can be more convenient, depending on the route you choose to cycle. Air Asia wants your bike in a box. Especially when flying from Bangkok. But we managed to convince them to take ours as is (no box, no plastic bag—just our bikes with handlebars turned and pedals removed). We also took off the derailleurs and secured them to the frames. Now I will say that the airline desk clerk almost fainted when he saw our bikes, sans boxes. We just kept smiling, and it all worked out. We flew into Mandalay and out of Yangon. At the airport in Yangon, the airline counter folks welcomed our unboxed bikes. No questions or fainting involved. To save money (with Air Asia), you’ll want to pay for your luggage (and bike) online ahead of time. They don’t charge by the item, but by weight. Your baggage is one fee. Your bikes, now under the “sports equipment labe,l” are another. Paying in advance can save you 30-40%. Make sure you overestimate on your luggage weight. Excess is charged at a pretty high rate. Note: If trying to get away with not boxing your bike, please be kind … and smile. It goes a long way. 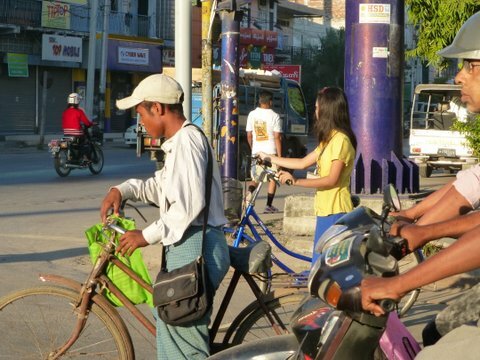 Every bike touring company operating in Myanmar is using mountain bikes. And you probably should too. Or at least a rugged touring bike. 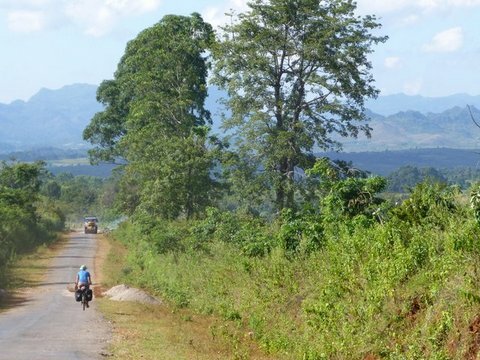 Myanmar’s roads go from bad to worse. If you arrive in the country with skinny 700cc wheels, you are not going to be a happy camper (oh, by the way, you can’t camp) … so I guess I should say you’re not going to be a happy ‘traveler’ instead. I don’t ride with shocks (neither does Kat), but there are times we wished we had them. As a foreign tourist, you are required to stay in a registered guest house or hotel. That means if there are five hotels in a town, and only one is registered to have foreign guests, that’s where you will be staying. As far as I know, Myanmar is not limiting the number of travel visas being issued. Because everyone and their friends, and cousins, and long-lost uncles have read that Myanmar is the new “hot” destination in travel, more people are arriving in the country than there are hotel beds to put them in. And there are all those business people who are looking to cash in on Myanmar opening up to the world. I’m not a fan of pre-booking a place to stay … but in Myanmar, it just might be the only way you will get a room. The answer to that one is “officially” no. You, as a foreign tourist, are not allowed to pitch a tent. You might be able to get away with it, if you are really discreet. But we have heard reports of travelers having their tents confiscated by police. If you are going to risk camping, please wild camp. Don’t ask some villager to allow you to pitch your tent outside their home. If the police get involved, it is the villager who is going to pay the higher price. I hope Myanmar progresses to the point where travelers are allowed to camp, but don’t hold your breath. This one is a bit tricky. You may have heard that you need US dollars. And not just any US dollars, but the kind of crisp, perfectly clean, unwrinkled dollars your grandparents gave to you in your birthday card when you were a kid. Well. It’s true. 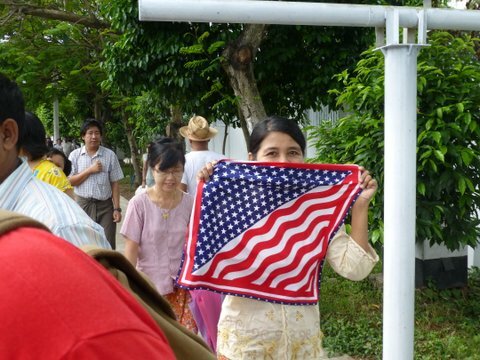 We met a man from the U.S. who arrived with plenty of cash to travel in Myanmar for a month. Every single bill was rejected at banks and hotels alike. Now, it’s not like his money was ripped and patched together with tape. It looked just fine to us. That’s how picky they are about your dollars. He was having to leave the country early, because, although he had a thousand dollars, he couldn’t spend any of it. I went to eight different banks in Seattle to get the clean cash I needed for our trip. One hundred dollar bills get the best rate, but it is best to carry some bills of all denominations for everyday transactions when you aren’t paying in kyat. That said, everything is changing fast in Myanmar. Reports are that the Central Bank is now accepting bent and wrinkled US dollars. Great. As long as you are dealing directly with the Central Bank. But you won’t be. You’ll be dealing with hotel clerks and shopkeepers. Until the message gets out to everyone (and that’s going to be awhile), don’t enter Myanmar without really, really clean cash. This is a situation where the law of supply and demand has rapidly increased the cost of traveling in Myanmar. Hotels and Guest Lodges that went for $10 a night or less three years ago, are now $25-$45. And we are talking basic rooms here. No frills. Considering that you can get a similar room in Thailand for $7-$10 … you might be in for a budget shocker. When we left Inley Lake (in mid-November), there were several tourists who couldn’t find a single room available, and had spent the night sitting under a tree. 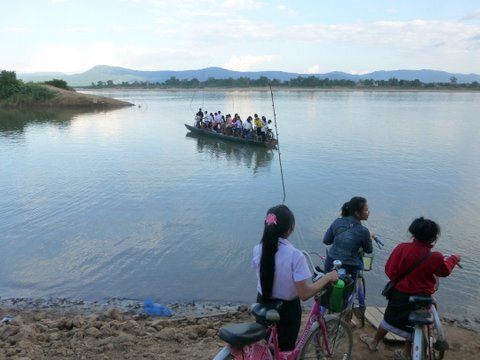 We aren’t ones to plan ahead, but if you are planning on traveling to Bagan or Inley Lake, make sure you call ahead to make a reservation at a hotel. Cyclists often arrive late in the afternoon. By then, scores of backpackers and tourists will have scooped up every bed available. 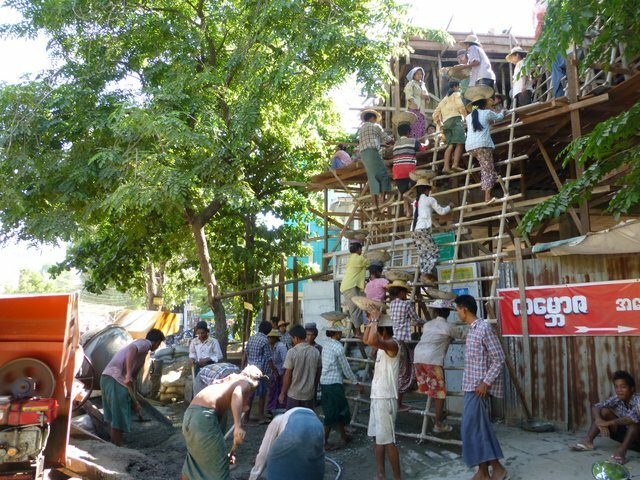 Internet access has opened up in Myanmar. You’ll find free WiFi offered at many hotels and guest houses. You presently cannot buy a data package for your cell phone. You can buy a sim card, but only for making calls. This can be really helpful to make hotel reservations in advance. Just wandering around Myanmar is difficult, due to the need to stay at a registered guest house. It is possible to get around this. But it is a bit of a crap shoot. We went to a monastery and were told we could stay. The monks were making up our room. Then the head master showed up and said it was not possible for us to stay. We had to leave. He helped us flag down a truck (the sun was setting) and we got a ride to the next town (city) that had a hotel open to foreigners. On another occasion, we pulled into a police station of a small town, and after calls and paperwork, we were hosted at the barracks. One of the policeman even bought us breakfast the next day. 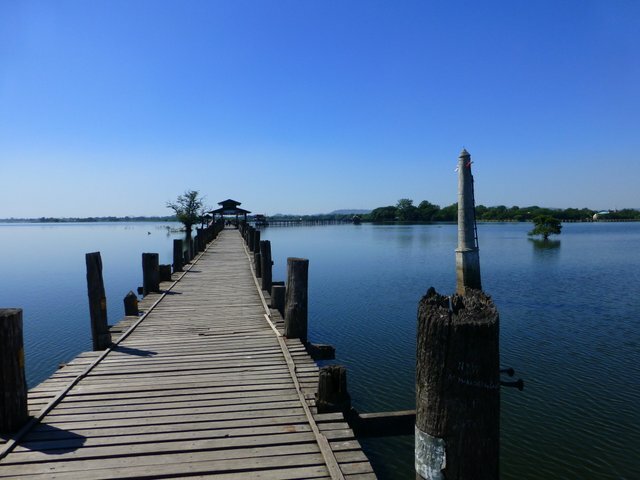 Many cyclists (including us) chose a route that included Mandalay, Bagan and Inley Lake. There are some back roads from Inley Lake to Mandalay that are really rough, but worth the effort. 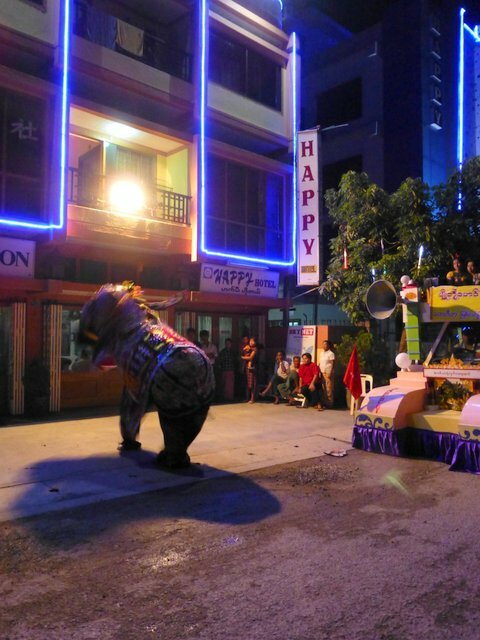 Personally, I’d avoid Myanmar during the holiday season (mid-December till after the New Year). It is going to be crazy. If you don’t already have a room at the major destinations … good luck. Traveling in February or March of 2012 will see fewer tourists, and a lot more heat. A hard choice for a cyclist. Hopefully Myanmar will issue more guest house permits — open more areas of the country to travel –allow folks to pitch a tent now and then. Will Myanmar see tourism skyrocket even further? If the room rates continue to rise, I doubt it. A resounding yes from both of us. No matter what the hassles, or the inflated prices and difficulty to get lodging, spending a month with the people of Myanmar was worth it … and then some. Originally posted on Adventure Cycling Association’s blog. Bathing at a community well in Mandalay city. I reach for the faucet to rinse my toothbrush and cup a handful of water to swish in my mouth, something I have done nearly every day of my life. But I stop. Just in time. I’m in a part of the world that doesn’t have purified water running in the taps. They don’t use potable water to wash their hands, clean their clothes, flush their toilets or polish their cars. Clean water in such abundance is a gift. Something I am truly thankful for, and something I think about every day I rinse my mouth with bottle water. Water is a life. Water is health. Clean water is a given in most of the United States, but not so around the world. I see families bathing in the irrigation canals or local wells, hoisting buckets of water from open tanks, filling drums of water carted on rickety racks hauled by bicycles, oxen, or pushed by hand. None of this water is safe to drink, first it must be boiled. A pot of weak green tea is on every table, boiled and ready for drinking, free for any and all to take. This a gift from the people for the people. 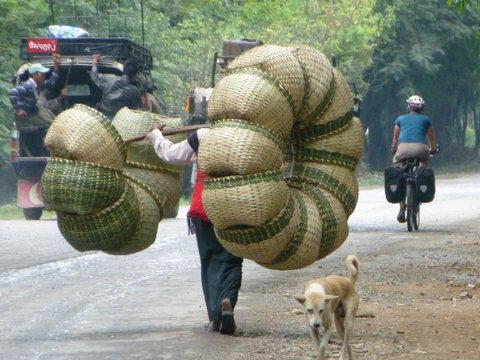 And this is daily life in Myanmar — the cities and the villages. Carting water from a well to home. I marvel at what we do have in the States. We had the political will long ago to build treatment plants, lay pipes, create an infrastructure for each and every city. It’s no small feat. The cost must be astounding, and the miracle of clean drinking, washing, bathing water happens with hardly a thought. Usually this time of year I take stock of my life and give thanks. This year, my thanks is for water. I wish us all an abundance of safe, healthy, life-giving water and the political will to help those without. By good luck and happenstance we are staying a short walk away from the motorcade route from the Yangon airport to the sites President Obama and Hilary Clinton will visit. With a tip from the policemen, we arrive in the morning and join the crowd lining the street as far as the eye could see. The sprinkling of American flags caught my eye and people warming returned my smiles. 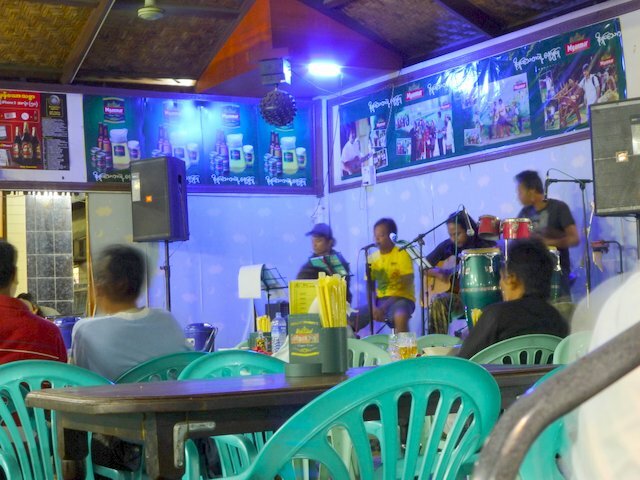 The collective energy fueled my last day in Myanmar like no other. -k.
After watching President Obama and Hilary Clinton zoom into town, we got on our bikes and pedaled over to Kyaukhtatgyi Paya to see the enormous reclining Buddha. (see the big picture) It was peaceful and reverent. I wondered why on earth not a single tourist was there? Then came the realization that the tourists physically couldn’t get there. Two of the city’s huge arterials were closed because of the President’s visit. Rack up another one for BIKES! 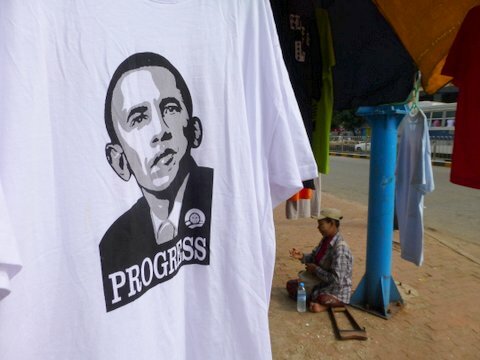 Capitalism at work on the streets on Yangon as entrepreneurs quickly embrace the excitement of Obama’s pending visit. I turned this t-shirt on the sidewalk by Bogyoke Market towards the light, only to reveal the begger sitting on the sidewalk just beyond. The great hope and great hardship side-by-side. It’s a hard life in Myanmar for the masses. Poverty and disability magnifies that difficulty beyond imagination. May all countries, including my own, take care of those who need it most. -k.